As Vivian wrote on her blog: “Kieffer preserves are so special in fact, I wouldn't dream of simply typecasting them as condiments for toast or biscuits. They've got way more potential than that." Toss the sliced pears with the sugar and lemon slices in a large bowl. Cover the bowl with plastic wrap and let it sit overnight in the refrigerator. (This step is crucial. Do not skip it. If you do, you'll make jam not preserves.) The next day, cook all the fruit and the accumulated juice over medium­low heat for about 30 minutes until the fruit is translucent. Pack fruit into hot, sterilized canning jars, leaving 1⁄4­inch headspace. 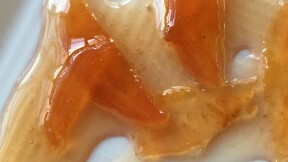 Cook syrup for 3 to 5 minutes, or longer if it is too thin. Pour hot syrup over fruit, leaving 1⁄4­inch headspace. Wipe jar rims and adjust lids. Process for five minutes in a boiling water bath. For more detailed instructions on boiling water bath canning, go to Fresh Preserving.